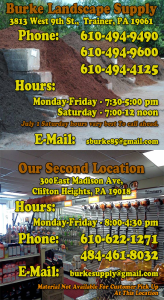 Burke Landscape Supply in Trainer, PA sells, services, and repairs your lawn tools. We have two repair service center locations to serve all of Delaware County, Chester County and parts of Montgomery County in Southern Pennsylvania. We even service parts of Northern Delaware including Brandywine, Claymont, Talleyville, Arden, and more. Stop by our Trainer location in Southeast Delaware County or our Clifton Heights store in Northeastern Delaware County. Come see us for all of your lawn maintenance repair parts! Burke Landscape Supply has your Lawnmower Maintenance Repair Parts Concordville 19331! We maintenance, repair, sell parts, and sell new lawn equipment. Stop by our store in Trainer PA today! Our professional and reliable services for both commercial clients and homeowners is tops. Come to us for your Lawnmower Maintenance Repair Parts Concordville 19331. With over 30 yrs of experience in the landscape industry, we have the knowledge to guide you. We sell, service, and repair landscape and snow equipment. Our niche is lawnmowers, chainsaws, snow plows, salt spreaders and more. Come see our choices from top makers including Echo, ExMark, Ferris, RedMax, Stihl, SaltDogg and Snow Dogg by Buyers, BOSS and WESTERN. We look forward to serving you in any season. Call us for all of your landscape needs in Delaware County. Seasonally we have a full line of winter supplies and maintenance parts for your snow plows and salt melt. Burke Landscape Supply offers our insight to keep your equipment running like new. We repair most landscape equipment. Do you need landscape replacement parts? We sell commercial parts and accessories including blades, filters, spindles, pulleys, tires, and more. Call our stop by today. Our professional sales staff will be happy to help you. Whether you’re a landscaping contractor or using landscaping tools like back pack blowers, chain saws, snow plows, snow blowers, etc. look to Burke Landscape Supply to find quality replacement parts for major manufacturers. Choose Burke to get instant access to the best products. Burke Landscape Supply sells new equipment and parts from eXmark, Ferris, Echo, RedMax and STIHL.